The New American Studies specialization program is a 30 credit program that Faculty of Letters MA students can add to their Master’s study plan to acquire a 120 credit MA with specialization. The intention to take the SPEC program should be announced to the Decanat (and to us — Borisand Agnieszka) at the end of the first year of your Master’s. Ideally you would take this program before writing your mémoire. This program situates itself on the frontier of contemporary American Studies as the field is being reconceived and reconfigured from within. 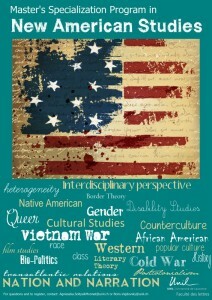 More international and transnational, comparative, interdisciplinary, theoretically informed and politically engaged, the New American Studies eschews the exceptionalism of the Cold War paradigm of American Studies and proposes to look at North America and its multiple cultures from a de-centered and comparativist perspective. The program is designed to initiate you into the methodologies, key texts, and dominant concerns of contemporary American Studies, especially those known as the New American Studies, American Cultural Studies and International American Studies. The introductory class combines cultural theory, historical narrative, textual and rhetorical analysis, and approaches to visual culture. You will learn how narratives, tropes and myths are studied in relation to a national or transnational culture critique, and explore basic issues in African American culture, feminism and queer studies, decolonization, multiculturalism and identity politics, and cultural theory. Contact Agnieszka or Boris and the decanat of the Faculté de Lettres at the end of your first year of master’s in order to sign up for the fall program.